Cancer is a scourge of humanity, and one that will affect more and more people as life spans increase. Approximately one in three people is struck by neoplastic disease in his or her lifetime. But, the other side of that coin is that two out of three people remain unaffected. Even the majority of heavy smokers, who bombard their lungs with carcinogens and tumor promoters over many years, remain cancer free. Naturally, the suffering of cancer patients and their families has inspired researchers to study the cellular changes unique to cancer and the genetics of cancer susceptibility. The genetics of cancer resistance, as a topic in its own right, has remained largely unexplored. Pathologists have shown that virtually all men age 60 or older have microscopic prostate cancer when examined at autopsy. Most of these microtumors never develop into cancer, however. It is also known that disseminated cancer cells are present throughout the body in most cancer patients, but only a small minority of these cells develop into secondary tumors. The rest are kept under control by the body. Indeed, metazoan evolution has led to many adaptations that protect species across the animal kingdom from outlaw cells. Immune surveillance plays a major role in the defense against virus-associated tumors, where the virally encoded transforming proteins provide readily recognizable foreign targets. But nonviral tumors, which are composed of aberrant host cells, do not provide such targets, and the immune response is suppressed by defenses against autoimmune reactions. Rather, we now know that the main safeguards against cancer are not immunological at all. Metazoan evolution has led to many adaptations that protect species across the animal kingdom from outlaw cells. Several cancer-resistance mechanisms appear to have evolved to maintain cellular or genomic integrity. For example, normal stroma, the connective material that supports the cells of a tissue, appears to inhibit cancer growth. Other resistance mechanisms include DNA repair, suppression of oncogene activation, tumor-suppressor genes, epigenetic stabilization of chromatin structure, and apoptosis. These mechanisms are well-studied, and each provides a potential road map for prevention and treatment. Abnormal cell division is a hallmark of tumor cells. The mutated genes responsible for this proliferation are called cancer genes, or oncogenes, but this is a misnomer. Their normal function is not to cause cancer but to participate in the regulation of normal cell division. Meanwhile, more-appropriately named tumor suppressor genes recognize the illegitimate activation of proliferation-driving genes and hit the brakes. Once again, mutations that disrupt this function can lead to cancer. Oncogenes Normal function is to regulate cell division. Mutations in these genes can drive aberrant growth. Tumor suppressor genes These genes recognize and stop the illegitimate activation of proliferation-driving genes. Genes involved in DNA replication and repair Mutations in these genes are sometimes referred to as mutator mutations, because they stall the cell’s ability to correct potentially cancer-causing mutations. Apoptosis genes Only when apoptotic mechanisms are functionally impaired can cancer develop. Tumor risk can also be influenced by mutations in genes that control the fidelity of DNA replication, the efficacy of DNA repair, and the checkpoint controls involved in DNA synthesis and chromosomal mechanics. Xeroderma pigmentosum, for example, stems from a specific DNA repair deficiency. The predominant form of this condition is caused by a recessive mutation in one of the essential components of the nucleotide excision repair (NER) system, whose main function is to snip out molecular DNA lesions caused by exposure of skin epithelium to ultraviolet light. Patients with xeroderma pigmentosum must protect themselves from sunlight all their lives, but they nevertheless develop multiple skin carcinomas, and in about one-third of cases, also progressive neurological abnormalities. This highlights the paramount importance of DNA repair as a frontline surveillance mechanism. Yet another group of genes associated with cancer formation regulates programmed cell death, or apoptosis. The normal function of the proteins expressed by these genes is to recognize superfluous, damaged, aged, or aberrant cells that must be eliminated. The importance of apoptosis is exemplified by the vertebrate adaptive immune system, in which B lymphocytes, as they differentiate from their precursor cells, rearrange the DNA of immunoglobulin genes to generate a vast number of potential antibodies. If an antibody happens to recognize an antigen in the body, the B cell producing it will be stimulated to expand clonally. But those B lymphocytes whose product does not bind a corresponding antigen must die to avoid clogging the system. Potential cancer cells that upset tissue integrity also elicit signals that initiate apoptosis. Cancers cannot develop unless the apoptotic mechanism is functionally impaired. The genes that contribute to cancer development by mutation, illegitimate activation, or—conversely—inactivation or loss are practically identical in all mammals. Is there any genetic variation among humans with regard to cancer resistance? There is no proof of this, but it is highly likely that it occurs. In genealogically well-mapped Icelandic families, there are several cases of six or more long-lived siblings with no cancer incidence and whose parents did not die of the disease. It is not possible, however, to distinguish between the existence of genetically resistant families and the occurrence of cancer-free families purely by chance. Interestingly, the sharp increase in human tumor incidence with age is followed by a decrease around 80 to 85 years. Centenarians rarely develop new cancers. The most probable reason is that cancer-susceptible individuals in the population have already died off. Freedom from cancer may be a necessary, but in itself insufficient, precondition to reach very old age. People with a type of dwarfism called Laron syndrome represent another documented example of cancer-resistant humans. Found in an Ecuadorian population with frequent cousin marriages, Laron patients have no problem with skeleton, cartilage, or joint development and, in contrast to other dwarfs, have very high levels of growth hormone. However, their cells lack a receptor required for the functional activity of the hormone.1 An unusual mutation in the growth hormone receptor gene appears to be responsible for cancer resistance in this case. There thus appear to be diverse mechanisms that protect against cancer. In addition to driving the proliferation of cancer cells, mutations or epigenetic changes may influence the ability of the cells to invade bordering tissues, to give rise to systemic metastasis, or to resist treatment. Notably, metastasis-favoring mutations may occur at a very early stage of tumor development, long before there are sufficient numbers of tumor cells to allow the manifestation of this property. 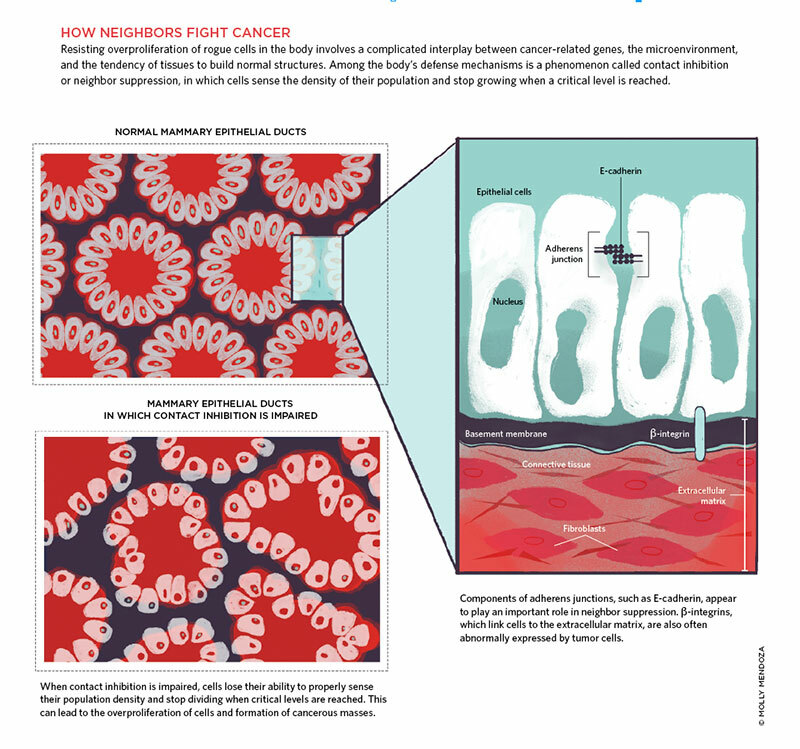 HOW NEIGHBORS FIGHT CANCER: Resisting overproliferation of rogue cells in the body involves a complicated interplay between cancer-related genes, the microenvironment, and the tendency of tissues to build normal structures. Among the body’s defense mechanisms is a phenomenon called contact inhibition or neighbor suppression, in which cells sense the density of their population and stop growing when a critical level is reached. Interestingly, the sharp increase in human tumor incidence with age is fol­lowed by a decrease around 80 to 85 years. Centenarians rarely develop new cancers. A few years ago, we reexamined the role of neighbor suppression in cancer resistance by labeling human prostatic carcinoma cells with green florescent protein and plating the cells alongside normal fibroblasts from different tissues. Fibroblasts from skin strongly inhibited tumor growth. While the tumor cells were not killed, and continued to grow in size and make proteins, they could not divide. Fibroblasts taken from cancerous prostates, on the other hand, hardly inhibited cell proliferation at all.5 In fact, these so-called cancer-associated fibroblasts (CAFs) may even support the growth and survival of adjacent tumor cells. Looking more closely at gene expression in these fibroblasts, we identified genes activated by inflammation or wound healing, a finding in line with the established fact that inflammation can favor the growth of cancer cells that have been inactive, often for long periods of time. This normalization of embryonic tumor cells in the early developmental environment is the most extreme example of the differentiation of malignant into normal cells. There are many other, less spectacular examples in the later literature. Highly malignant murine leukemia cells can be induced to differentiate into nonmalignant cells by natural or artificial substances. One form of human leukemia, acute promyelocytic leukemia, is routinely cured in this way: the combination of a naturally occurring signal receptor and an empirically identified chemical compound, genistein, induces the cancerous cells to differentiate from a granulocyte precursor into a mature myelocyte that can no longer divide.7 Although similar examples are still relatively few, they suggest that most and perhaps all tumors could be induced to differentiate and stop growing if one could find the right combination of inducing substances. George Klein studies Epstein-Barr virus, oncogenes, and tumor-suppressor genes in the Department of Microbiology, Tumor and Cell Biology at the Karolinska Institute in Sweden. BLIND MOLE RATKUDINOV/WIKIPEDIANAKED MOLE RAT© JOEL SARTORE/GETTY IMAGESTwo species of mole rat serve as exceptional examples of cancer resistance. The blind mole rat (BMR) and the naked mole rat (NMR), which live up to 20 and 30 years, respectively, never develop the disease. Understanding the molecular mechanisms that afford these animals such powerful protection against cancer could inform the fight against human cancers. The NMR, a eusocial species that lives in highly organized matriarchal societies, has to force its way through narrow and often sinuous underground tunnels. The connective tissue in its skin contains a high-molecular-weight form of hyaluronic acid (HA) that makes the animal’s skin malleable like model clay. The corresponding HA in mice and humans has less than one-fifth the molecular weight. The heavy form of HA that occurs in the NMR prevents the transformation of normal cells into cancer cells; only after it has been removed can the NMR’s cells be transformed into cancer cells (Nature, 499:346-49, 2013). Moreover, NMR fibroblasts exhibit an unusual form of contact inhibition. Mouse and human fibroblasts inhibit their own continued proliferation when they bump up against other cells. NMR fibroblasts do this much earlier, when cells barely touch one another. When the cells come into contact, p16, a protein involved in causing growth arrest, is upregulated. This is not seen in the late contact inhibition of human and mouse fibroblasts, where another growth-arrest protein, p27, is upregulated. In contrast to the NMR, the BMR is a solitary, nonsocial, and aggressive species. And its cancer resistance mechanisms differ from the NMR’s. The BMR does not have heavy HA or early contact inhibition, but when its fibroblasts grow to confluence they commit collective suicide by releasing a type of interferon (PNAS, 109:9392-96, 2012). Once again, evolution appears to have devised diverse solutions to keep rogue cells in line, and in these two cancer-free species, those mechanisms may be key to their remarkable longevity. Z. Laron, “Growth hormone insensitivity (Laron syndrome),” Rev Endocr Metab Disord, 3:347-55, 2002. W. Zhang et al., “E-cadherin loss promotes the initiation of squamous cell carcinoma invasion through modulation of integrin-mediated adhesion,” J Cell Sci, 119:283-91, 2006. V.M. Weaver et al., “Reversion of the malignant phenotype of human breast cells in three-dimensional culture and in vivo by integrin blocking antibodies,” J Cell Biol, 137:231-45, 1997. A.B. Glick, S.H. Yuspa, “Tissue homeostasis and the control of the neoplastic phenotype in epithelial cancers,” Semin Cancer Biol, 15:75-83, 2005. E. Flaberg et al, “High-throughput live-cell imaging reveals differential inhibition of tumor cell proliferation by human fibroblasts,” Int J Cancer, 128:2793-802, 2011. B. Mintz, K. Illmensee, “Normal genetically mosaic mice produced from malignant teratocarcinoma cells,” PNAS, 72:3585-89, 1975. A.P. Ng et al., “Therapeutic targeting of nuclear receptor corepressor misfolding in acute promyelocytic leukemia cells with genistein,” Mol Cancer Ther, 6:2240-48, 2007.